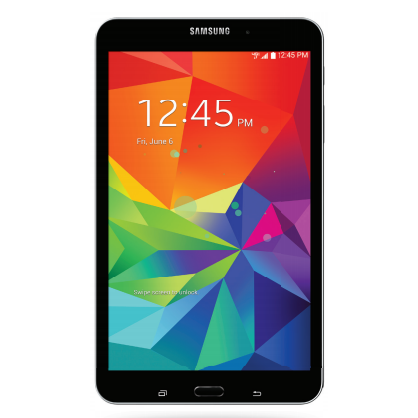 On the AT&T side of things, only the Galaxy Tab 4 8.0 is technically a new update - Samsung itself reported that the 10-inch version was being updated last week. Presumably it hasn't actually been sent out without the carrier's approval. The updates to both the 8.0 and the 10.1 are nearly identical to the Galaxy Note Pro 12.2 update that was issued at the same time: it enables Google Play Store billing for those on standard contract-style accounts, Samsung's Kids Mode through the Essentials proprietary store, and a few "Google security and stability enhancements." As with other AT&T updates, the new software builds can only be downloaded over Wi-Fi. Because why let people use that data they're paying for, huh, AT&T? 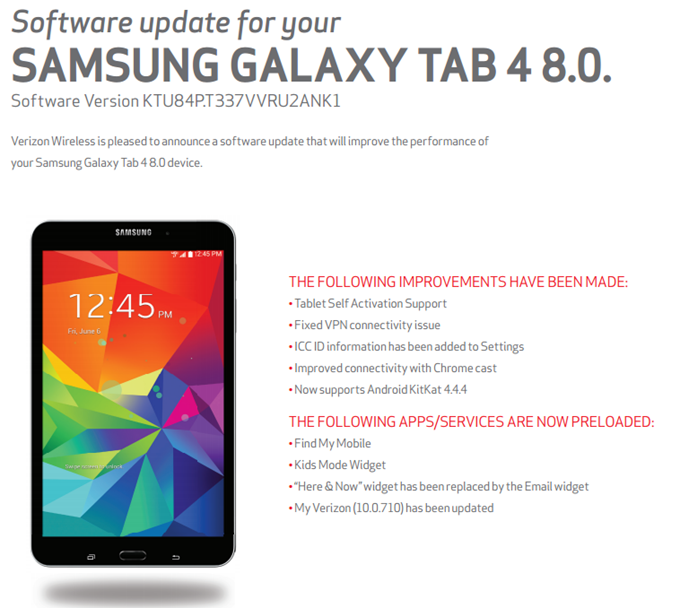 The Verizon versions of the Tab 4 8.0 and 10.1 get a more significant update, bumping them up to the final 4.4.4 release of Android KitKat. The 8-inch tablet gets the ability to activate a new account from the device alone, an ICC display in the Settings menu, improved Chromecast support (perhaps screen casting? ), and a VPN fix. The 10-inch tablet gets most of the same updates, but for some reason Chromecast support isn't mentioned, instead replaced with a Hancom Office app update for comments on PDF files. Both the Galaxy Tab 4 8.0 and 10.1 on Verizon get some more bloatware in a Find My Mobile app, a Kids Mode widget, and a new version of My Verizon. The 8.0 replaces the Here & Now widget with a standard email widget instead. Verizon customers can download the OTA update on either Wi-Fi or mobile data.